Submitted by witness DH on Tuesday, May 4, 2010. OBSERVED: This sighting was on the night of Monday, 05.03.2010. My 12 year old daughter and I picked up my son (age 18) at Dulles International Airport (Virginia) at 9:45 pm and proceeded south on Route 28. My daughter was riding in the front seat; my son rode in the back seat. I became disoriented and missed our turn. After driving down roads that had unfamiliar names, were unmarked by lines, and even having to drive around part of a pine tree that had been broken and looked to be thrown in the middle of the road--we backtracked. In the area of the sighting, the speed limit drops from 45 MPH to 35 MPH. I dropped my speed to heed the limit. We came to a corner where there is a church. Crouched and bent over near the ditch/beside the road and directly in front of the church, was a large auburn brown figure. It appeared to have its back toward the road, so I saw no face. The fur texture, shape, and lay were similar to a grizzly (brown) bear. I saw it but said nothing. My daughter immediately said, "Did you see that?! What was it?" I joking said, "I don't know, maybe it was Bigfoot." My son said he was looking forward and only saw a reddish brown color difference in his peripheral vision. The time was approximately 11:00 pm. I asked if I should turn around and go back to see. The kids said to keep driving because they were already rattled by being lost late at night. They didn't want to waste any more time getting home. We arrived home between midnight and 12:30 am. I immediately got online to look at MapQuest to figure out our route; not because of the sighting, rather to see how I had gotten so lost. I assumed we saw a brown bear foraging for food. I mentally noted that the broken tree was in the vicinity of the bear sighting. Today (Tuesday, 05.04.2010)I began research on grizzly (brown) bears in Virginia. I found a Virginia Department of Game and Inland Fisheries PDF link stating that grizzly (brown) bears do not live in Virginia. Virginia is home to only black bears. (See Narrator, p.3 at http://www.dgif.virginia.gov/video/living-with-black-bears/living-with-black-bears-transcript.pdf.) Now, I think what I had joked about may have been a Bigfoot sighting. ALSO NOTICED: Before the incident we saw a broken tree in the vicinity, laying in the middle of a road. It looked as though it had been thrown in the road. OTHER WITNESSES: 3 witnesses: DH (mother, age 42), J(daughter, age 12), and J (son,age 18). All witnesses were emotionally tense because they were lost. Witnesses became calmed right before sighting because they had turned on to a familiar road that would eventually lead them home. See detailed description under "What was seen, heard, or found?" TIME AND CONDITIONS: This happened at night, approximately 10:30-11:00 pm. The figure was illuminated by car non-halogen headlights as we rounded a curve. ENVIRONMENT: Rural country road with nearby woods. After talking to the witness for more than an hour two different times, I do believe that she is a credible witness. She is a school teacher in VA. 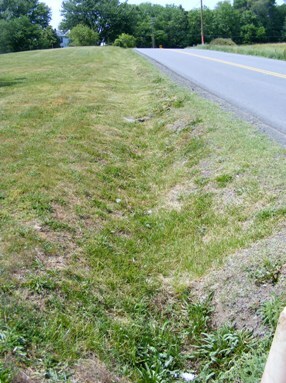 This is a photo of the ditch where the animal was seen crouched and bent over next to the road in front of the church. I talked to the pastor of the church and he told me that there was a car accident prior to this incident. The accident took out several telephone poles and several trees. The pastor removed one of the trees a few days after the car accident and took it across the road to a property that the church has. The pastor took me over to the field to show me where the tree was placed. I found possible old shelters or blinds and this arched tree that was pinned by a large rock. I do believe that this is a good hunting area for a large animal due to the large number of deer and fresh water ponds in the area. After checking with Virginia Game and Inland Fisheries, they verified that there are no brown bears in Virginia. The pastor asked me not to make the location and the church name public. This is an on-going investigation with the cooperation of the pastor and local residents. These are quick sketches of the figure seen in the ditch that evening, the 1st one drawn by the mother and the 2nd by the daughter. Olaf works for a world-wide communications company. He has attended several public and private expeditions in WV, NC and Ohio since 2005. 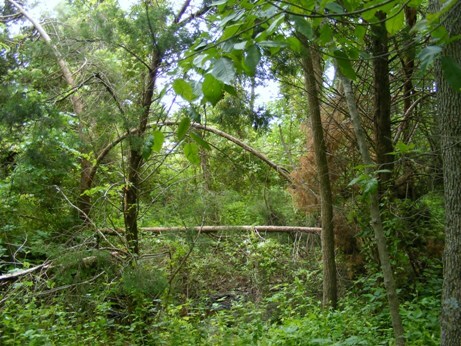 See Olaf's blog The Woods are Alive for photos and recordings he has collected over the years.